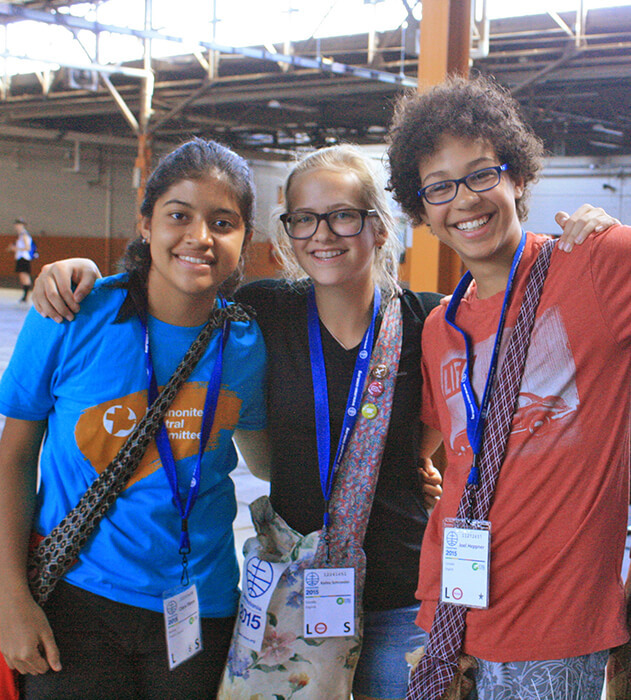 She’s one of nearly 700 teenagers who added a special vibe to Assembly 2015, thanks in part to cooperation between MWC and Mennonite Church Canada, which decided to hold its usual biennial youth event in conjunction with the assembly and then threw its evening programming open to U.S. and international participants. Some 315 of the participants were from Canada, with the rest mainly from the United States and about 70 from other countries. An international MWC committee under the leadership of Egon Sawatsky of Paraguay, offered morning sessions connecting with the theme of each day, following the first part of the morning worship. Thursday morning closed with prayer circles of about 16 participants each near “prayer poles,” on which was placed a summary of an issue—the conflict in Ukraine, for example—which the teens discussed and then prayed about together. For some teens, the youth events have been just as much about happy reunions as the Assembly is for adults. Clara Flores, who now lives in Honduras, and her BFF, Kailey Schroeder, met when they were 5 or 6, when their parents were serving in Bolivia, and are delighted to be spending time together. Evenings at Messiah College, where many of the teens stayed, offered more fun activities, from a concert one night by The Walking Roots to a giant Dutch Blitz game. 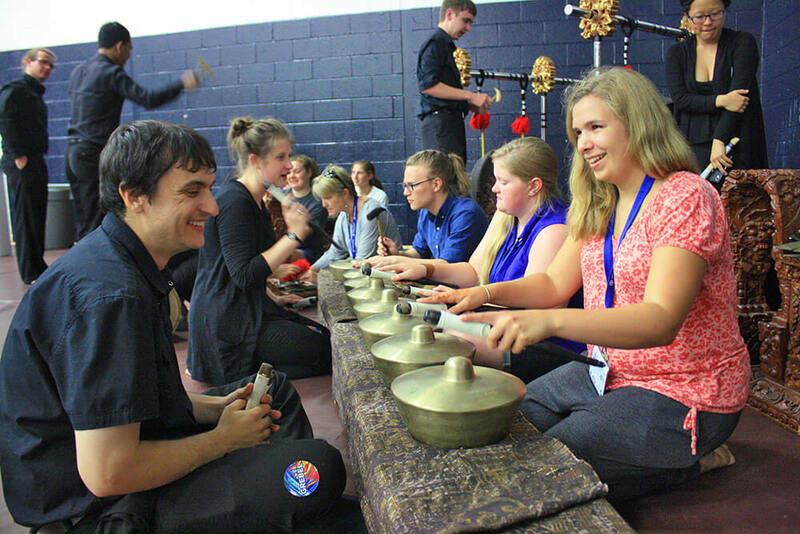 On Wednesday night, the Grebel Gamelan visited, giving youth a chance to try their hand at playing the Indonesian instruments. Others played indoor soccer or board games, or just hung out enjoying an evening snack. David Bergen, executive minister for Christian formation at Mennonite Church Canada, said that once the conference had made the decision to hold youth events in Harrisburg, two Canadian colleges stepped in to help: Canadian Mennonite University and Conrad Grebel University College. When a significant number of Americans also registered, Eastern Mennonite University also joined. Each planned activities for one of the evenings. Ashaneé Cooper, from Capital Christian Fellowship in Maryland, was wearing a collection of other kids’ Assembly tags around her neck Wednesday night while watching a wild game of Hungry Hippos. In this game players, lying on their stomachs on a tethered moving dolly, roll into a pile of balloons holding a plastic bin with which to capture a balloon or two before being reeled back by their teammates. The 14-year-old said she loved the music and getting to know new people from other countries like Canada and Brazil. “I was already close to God, but this helps me meet new people who are as close to God as I am,” she said. And really, isn’t that what this gathering is all about? Doreen Martens attends Toronto (Ont.) United Mennonite Church and serves on the board of Canadian Mennonite. Read what the young adults had to say about their assembly experience.